The 1176 is probably one of the most replicated pieces of gear in the history of audio. It seems everyone has some sort of new and improved software version of the classic compressors and hardware companies always charge an arm and a leg for their rendition. Bryce Young of Warm Audio has released his own version with his own spin, minus the arm and the leg. The WA76 has a longstanding relationship with Cinemag, rightly so seeing as these transformers shaped much of the sound of classic recordings going as far back as the 40’s. The Reichenbach transformer was actually used in the original Urei 1176, therefore Warm Audio’s choice of using Cinemag was ideal. Reason being that Cinemag bought out Reichenbach some years ago. This isn’t your average Cinemag transformer though. The WA76’s transformer is the complete resdesign of the original Reichenbach transformer in the 1176. Bryce Young worked closely with Cinemag to ensure that the transformer going into the WA76 is exact to the original Reichenbach transformer used in the Rev D models (this rev D model is the quieter 1176 with the improved circuitry that most companies emulate now days). The signal path is discrete and features a Class A line lever output amp. The layout is a pretty much to spec with the original with the exception of that great looking orange logo on the black face. We pretty much all know how to work an 1176 so there’s no real need to get into the specifics of how they work so lets get into the features. You are given all of the same ratios as the original plus the “all buttons in” nuke mode. If you’re a patient person and love the sound of just the transformer with no compression, you can disengage all ratio buttons and after waiting a couple of minutes for the release to settle out, you can just use the gain staging to add vibe to your tracks. You have the same fast attack and release times as the original. One of the main differences is in the slightly stepped input and output knobs, but more on that later. On the right side of the VU meter, you have the different metering modes accommodating gain reduction and both +4 and +8 output metering. On the rear you have the Warm Audio standard of both XLR and ¼” TRS inputs and outputs as well as a 20DB pad to tame those preamps that do not have an output trim. Like all of the other Warm Audio products, the power supply is on the outside, but really doesn’t pose any problems. It’s just a little more space taken up behind the rack, but who’s looking there anyways? Even the most OCD could handle a little extra real estate seeing as the WA76 comes in around $1400 LESS than the UA Model. So it looks like a real 1176, has all of the features of the 1176… but does it SOUND like the 1176? It’s pretty damn close. Now initially it does sound like a negative thing when you see words like “close” but this is actually a good thing. Yes it does sound close to the original. It has very similar characteristics to the original, I did however, notice more of a weight to the track compared to the original 1176. I found I liked it more than the original. On a vocal track, it establishes dominance in a busy song, on a bass, it adds just a little more oomph without taking over the low mids. There is definitely more “balls” to this compressor than the original. It was a little less subtle than the original on the same settings but that could be very easily fixed by using it more light-handedly. I even took it to a live gig with the same preamp I used in the test and ran it through an acoustic guitar. Even just using the onboard electronics on the guitar, it handled the sharp transients great. The WA76 took a lot of the bite out of the teeny saddle pickup. I didn’t feel too guilt about lugging it around either. It has no feeling of being a discount version of hardware. The knobs and buttons are all solid, its not made of all plastic, and it even looks great. I didn’t really find the stepped input and output knobs that useful seeing as I was just running one unit; but as I kept using the WA76, I was noticing I wanted to put it on stereo tracks and busses. Having these slightly stepped knobs would allow for precise setting both units at the correct input and output, which we all know is the essence of the 1176. I would’ve liked to have seen a push pull knob that would let you switch between stepped and smooth tuning, but at this price range, I understand that some things need to be sacrificed. I’m still baffled at how Warm Audio have managed to cut the fat off of the price point. Everything that needs to be there for an incredible compressor is there. No sound quality was sacrificed one bit for the sake of saving money. They easily could’ve hiked the price up on this one but for some reason, Bryce has seen it in his heart to throw us a bone and let us run with the big guys with quality gear. It almost baffles people I tell about the WA76 because they feel that due to the price that it couldn’t possibly be as good as the original. 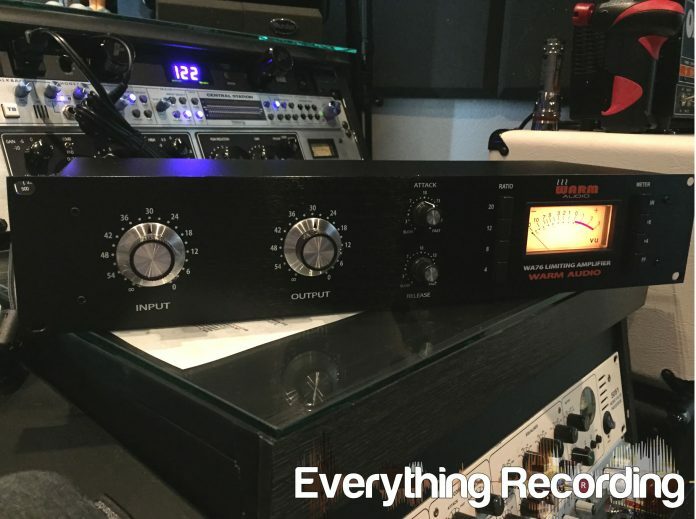 We’ve all been told that in order to get high-end sound that we need high end gear, and this is very true for most situations; but there is an exception to every rule. All hail the new exception! Below is a song where I used the WA76 on every mono track in the mix. I used it in tandem with some pre-Warm Audio preamps Bryce built. The signal chain was put on Acoustic Guitar, Bass, Vocals, and the kick. The Acoustic has no EQ on it other than a high pass filter and the vocals were just touched to pull some resonance out in some frequencies. Even though the kick was electronic, I ran it back through the signal chain to add a little flavor. If I would’ve had a pair, I would’ve used it across the whole track but that will have to wait until next time. Enjoy!